When flying long distances on airliners, especially in Economy class, I try to make my life a bit easier each time I fly. For our most recent trip to Milan, Italy for a screenwriting conference, family visiting and sightseeing, I decided I wanted a better audio experience than the past. Back in January I picked up the VAVA MOOV 28 Wireless Headphones Sports Earphones from Amazon to replace — yet another — dead pair of Apple headphones. These have delivered great performance and significantly cut down on environmental noise. So much so that I needed to be more careful when out walking as my hearing was supressed and I couldn’t always hear cars and bikes approaching. This feature, though, seemed like it would be great on n airplane, though. Now, I don’t have hundreds of dollars to put out for a nice pair of over-the-ear noise cancelling headphones as much as I might want them, so I went looking for the way to use these new headphones on the plane. This meant picking up this small (the size in the picture is quite deceptive) Aluratek - Bluetooth Audio Receiver and Transmitter from my local Best Buy, I was cutting it short on time and needed to pick it up locally to insure I had it for the trip. I tried out the pairing while sitting at my desk ti make sure it would work once I got on the plane. Several reviews had mentioned issues with pairing. This worked perfectly the first time. I turned on each device and placed it into pairing mode. After about 15 seconds they recognized each other. Another issue I had seen mentioned with Bluetooth transmitters is that the volume levels weren’t sufficient for some people. In my case, though, after insuring the volume was set to full on the transmitter and on the audio source, I could turn up my headphones loud enough that it was actually uncomfortable. My experience with the devices on the plane was the same. I connected the transmitter to the headphone jack in the seat back in front of me, powered it up and the headphones, set the setback entertainment volume to 90% or so and enjoyed excellent audio — especially compared to the typical cheap headphones given out by the airlines. This, combined with the natural noise-muffling of the in-ear headphones meant I could hear my movies perfectly and listen to audio as I drifted off to sleep, something I like to do on planes. Not that you necessarily need it, but I found that the transmitter had plenty of power to reach me even as I walked about the cabin to stretch and visited the bathroom. I simply forgot to take off my headphones and only noticed when was was standing 20 feet away or so that the music was still in my ears. Both Aluratek - Bluetooth Audio Receiver and Transmitter and the VAVA MOOV are rated for 9-10 hours of battery life and that was almost exactly what I got. that said, since I had a USB port at my seat, I could have recharged either, or powered the transmitter continuously, from that plug. I did give a quick recharge to my headphones towards the end of our 11+ hour flight and then was able to continue listening without any trouble. While most International Flights use more modern aircraft and provide standard 1/8” headphone jacks, you might find that picking up a airline headphone convertor — which take the two-prong connector and converts it to a standard headphone jack, might be worthwhile backup. I would also recommend a right angle 1/8” adapter, instead of the straight cord that comes with the the transmitter, in case you happen upon an aircraft with the headphone jack on the inside of the armrest. This will prevent you from damaging or being inconvenienced by the transmitter. 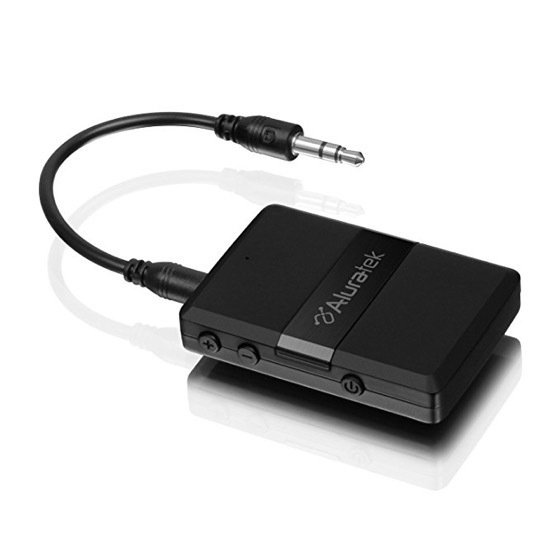 Overall, I was very happy with my experience with the Aluratek - Bluetooth Audio Receiver and Transmitter and plan to use it around the house for both sending audio to my media center sound bar and turning older powered speakers into bluetooth speakers.